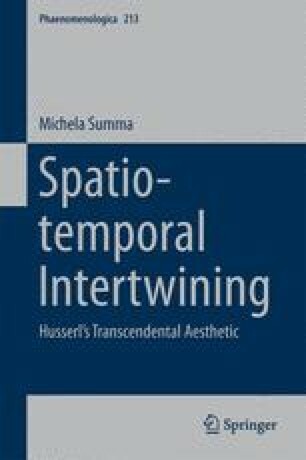 This chapter compares Husserl’s and Kant’s approaches to the transcendental aesthetic. Husserl’s critical reading of Kant’s philosophy, and particularly of his understanding of sensibility, is assumed as a guiding thread of inquiry in the first part of the chapter. The outcome of this critical reading is the phenomenological redefinition of the boundaries between aesthetic and analytic. The evaluation of such a redefinition allows us to point out and emphasize the distinctive features of Husserl’s phenomenological aesthetic. The second part of this chapter takes some distance from Husserl’s reading of Kant and discusses those aspects in Kant’s philosophy, which may complement the phenomenological project. On the basis of such a cross reading of Kant’s and Husserl’s texts on sensible experience, a refined understanding of the concept of stratification is advocated. This assessment of the role of sensibility allows us to understand how the transcendental aesthetic shall be integrated within a dynamic account of experience considered as a complex and stratified whole.